When the temperature drops and you can't find the motivation to get out fishing, all you need to do is get your base layering right. So if you are wearing a pair of waders or bib and brace, an additional pair of thermal leggings or trouser will give you a welcome layer of insulation. Even if you are spending a few hours outdoors, cold evenings or during winter, thermal fleece trousers can make a huge difference. A base layer is normally worn next to the skin or close to the skin in a system. In terms of the legs, the system normally comprises of a pair of thermal leggings or fleece trousers which fit snuggly to your body. It essentially functions as an extra layer of skin on your body and depending on the moisture wicking properties of the garment, will transport moisture away from the body therefore preventing you from getting refrigerated. However, heat is retained. Eiger Black Thermal Fleece Trousers make the perfect thermal base layer. They are made from 100% soft polyester coral fleece in 300g with a high loft function for extra warmth. Brushed on the inside and featuring an elastic waist and lycra bottom leg cuffs for good fit and more importantly, keeping heat in! They are light, comfortable and durable. 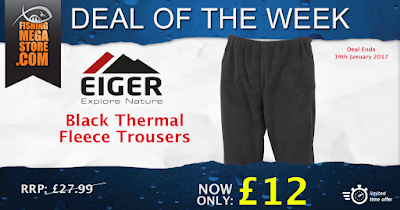 For Fishing, Eiger Thermal Trousers are perfect. If you are Trout fishing from the bank or boat and it's a cold, windy day, worn with a pair of waders, good quality waterproof trousers or bib and brace your legs will be totally warm and snug. Of course you want to enjoy your days fishing without feeling miserable, so a pair of thermal fleece trousers are a fantastic investment. Alternatively, if you are a salmon angler or spend a lot of time in the water spinning, casting and moving between croys in safe water, you need that extra layer to insulate you from the cold water temperature. Without breaking the bank you can continue to enjoy your fishing no matter what mother nature throws at you. Even if you are a keen sea or predator angler, a pair of Eiger Fleece Trousers will give you the confidence and comfort to fish during the harshest conditions.